Wow the ideas are flowing and I did promise myself I wouldn't start work until my son starts school on Wednesday, but those little maids just keep chattering and getting excited, waiting to be allowed out in all their glory. So I gave in and as a result we have another: it is all ready, waiting to be model stitched. I thought we were going to have a Christmas maid as the lady involved had already told me quite strongly exactly what she wanted to wear. It seems the little ladies as a collective group however had different ideas altogether. "No, I don't really do Halloween: I'm not sure the Victorians did either so perhaps we should stick with Christmas?" "Psh Psh" they replied in reproaching tones. "What about Frankenstein's Monster and Dracula? When do you think they were written?" Mmmmmm not sure so I thought I had better google it. Well, those little ladies were right. Victorian times were indeed when Gothic Halloween and Horror were born! Well! They must be quite clever, those wee maids. So I gave in and another was born! Boo-tiful in Black!!! She is already to be stitched up. I did think the gravestone was a bit much but M'lady told me she loves nothing better than sitting with her lady friends on Halloween and scaring each other silly with horror stories! Ah well, each to their own! I have a lovely lady stitching another design which will be released soon and...there's more. You should be able to click on the chart, if not just email me stitcheranon@yahoo.co.uk and I will email a pdf copy to you. On another slightly cheeky note, would any of our USA friends like to stitch a small USA patriotic chart? I just don't have time and want a nice finish to put on the Patriotic Chart set which the printer will be putting altogether in a leaflet. You will be given a credit on the charts and the picture of your finish used. Boy....this is more intricate then I would have thought but I am having fun and as long as I am having fun, it is all good! Whilst I was arguing with the ladies in my mind (don't worry: I am still relatively sane), I thought I would play around with the crochet. I made a crazy looking chicken and then adapted the pattern to make a robin redbreast...yes ladies; I have to start the xmas stuff and I am even considering doing some craft fairs...but only if it is fun! And I'll leave you with a real crazy chicken: four hen houses and Little Red chose to nest in my old wine rack which is in the garage. Apparently hens like Scooby Doo bedding over hay and sawdust. 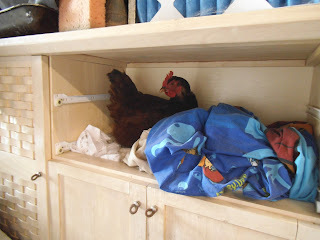 This is where this little hen wants to lay her eggs! Right, it is late. Tomorrow is my son's last day of home ed and freedom as he starts school on Wednesday. We're giving him the choice of what he wants to do tomorrow and we'll be spoiling him as we are so proud of him. As soon as I was diagnosed he said he wanted to try school. He has looked around several and Strokestown was the one he decided on. It is a fair distance away and we have to pay for a private bus but it does seem to be a very good school and we raised him to have the courage to make decisions just like this. He has shown remarkable maturity for one so young! 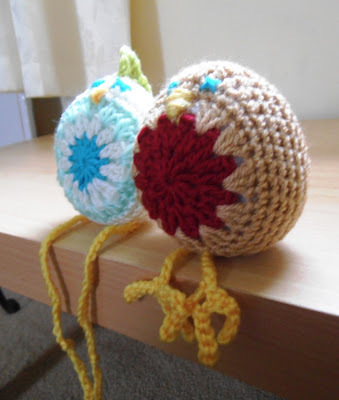 I love your crocheted chickens just so flipping cute. 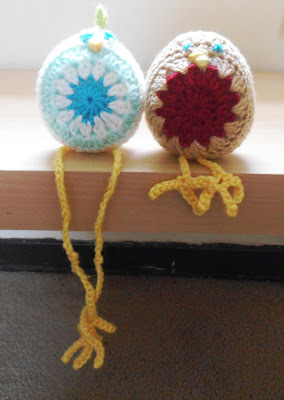 Your crochet birds are fabulous! I love how your coming up with ideas for the ladies. Looks like your giving them the attention they need. Your freebie is cute. The saying is perfect. Thanks for sharing. Ha Ha Ha what adorable chickens. I know they will sell quickly. Awww what a sweet hen. 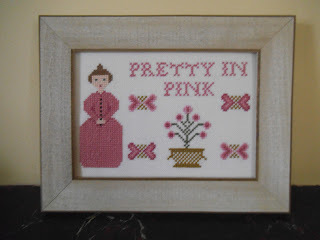 I'm in California and would love to stitch up a chart for you. I don't have any obligation stitching at this time. Please and Thank you for the chance. Good luck to your little man as he starts his new school today, I hope he soon makes lots of new friends. He'll have so much to tell you about when he comes home tonight.. exciting times. You are on a roll with everything! Love the Halloween maid and your little chicks!